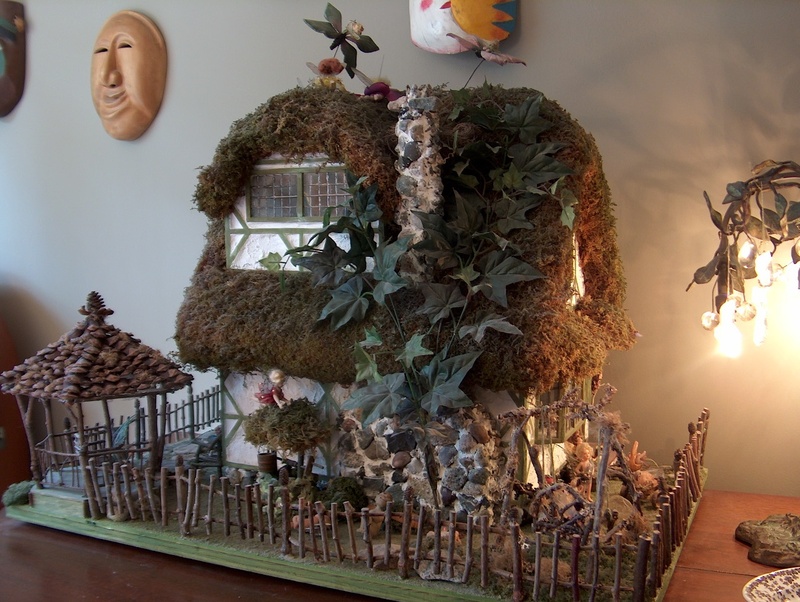 This is my dollhouse for which I created most of the contents. 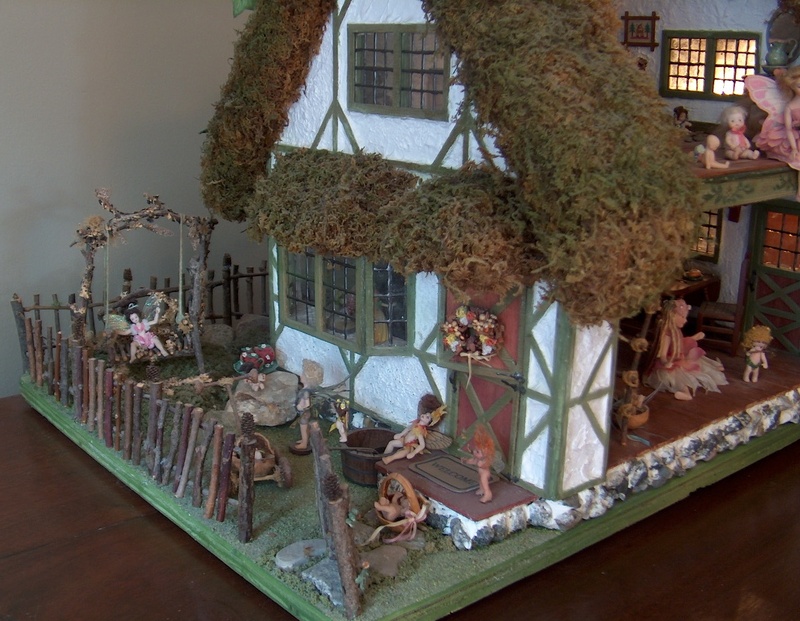 I built it from a Corona Kit named "The Aster Cottage." 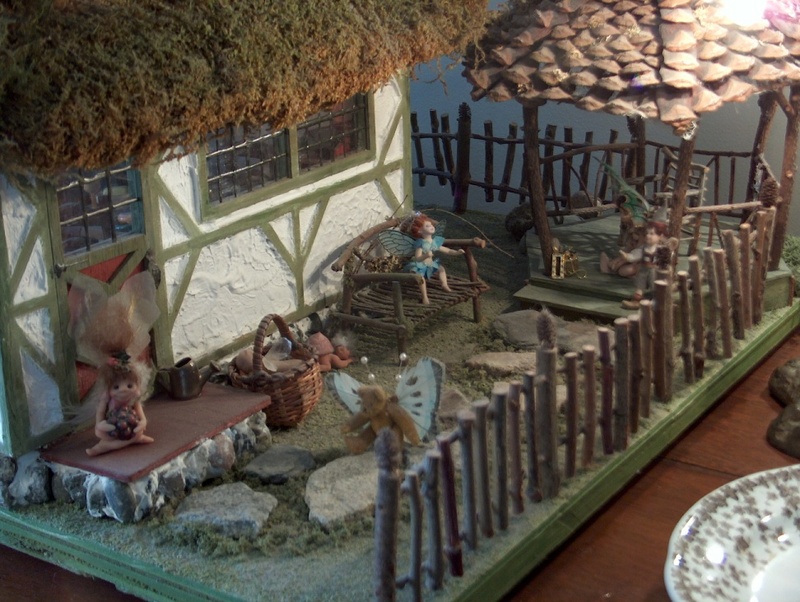 The house is a little house in the real, big world - hence no miniature trees or flowers; a cradle made out of a real walnut shell; and a real bird's nest wedged between the chimney and roof, nestled in the full-sized ivy. 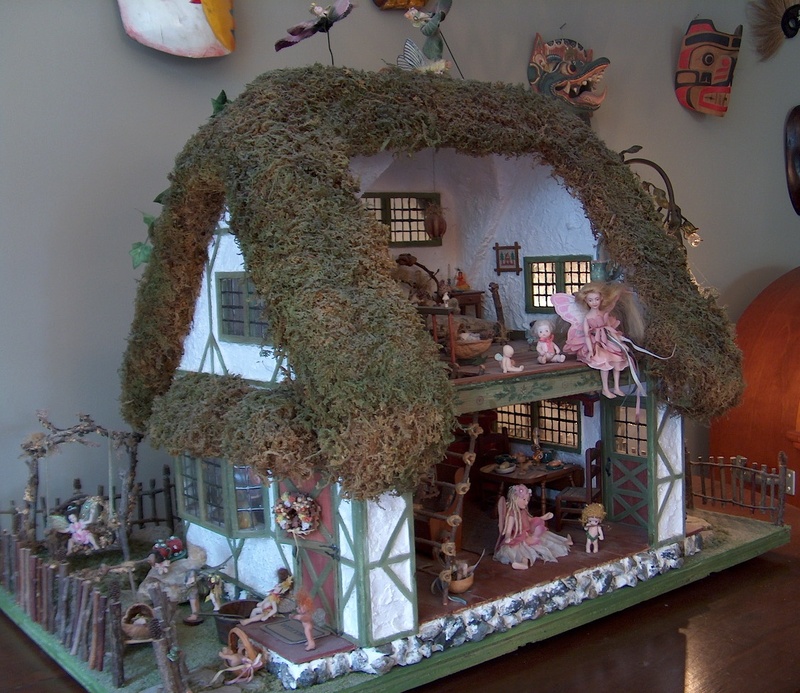 The roof of the dollhouse is covered in "sheet moss" purchased from a craft store, and sprayed with moss colored florists' spray paint (much finer than regular spray paint). 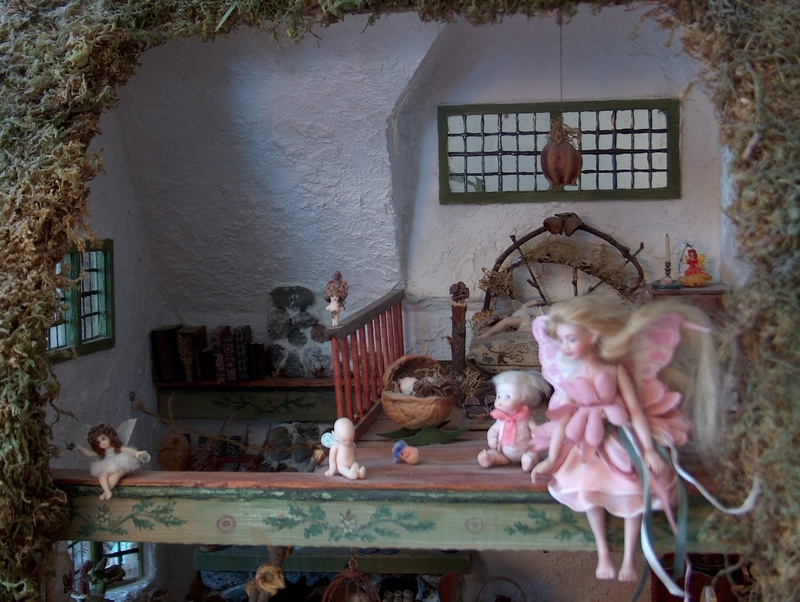 There are fairies and baby fairies everywhere... sleeping, flying, and watching over each other. 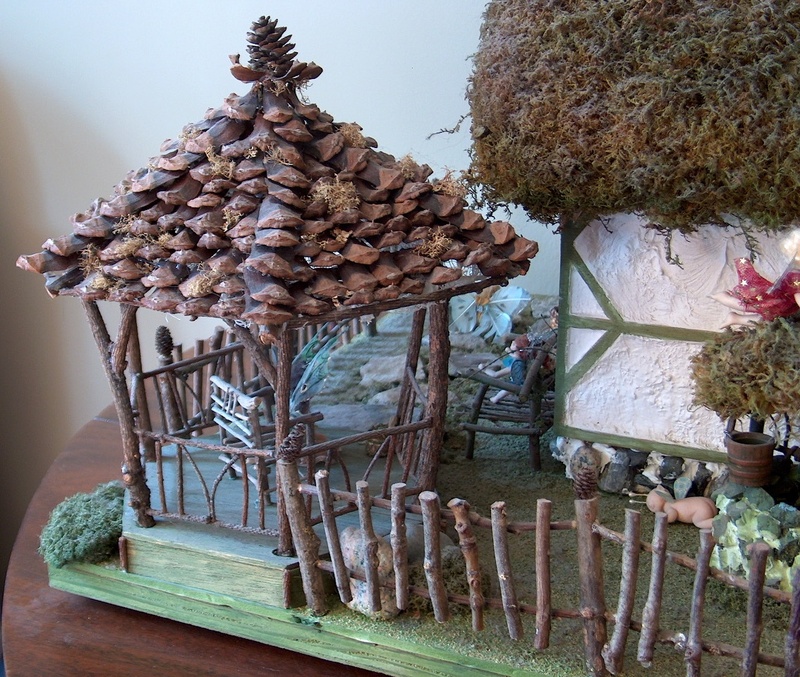 I shingled the twig gazebo's roof with "petals" I cut from pinecones. The rocks on the foundation, chimney and fireplace came from a beach in my area. The stucco is Spackle. My son Ian designed the well's crank so that it really lowers and raises the bucket. I didn't use the provided interior beams or rails, but made my own out of more substantial lumber (1" x 1" molding) which I notched on the edges. 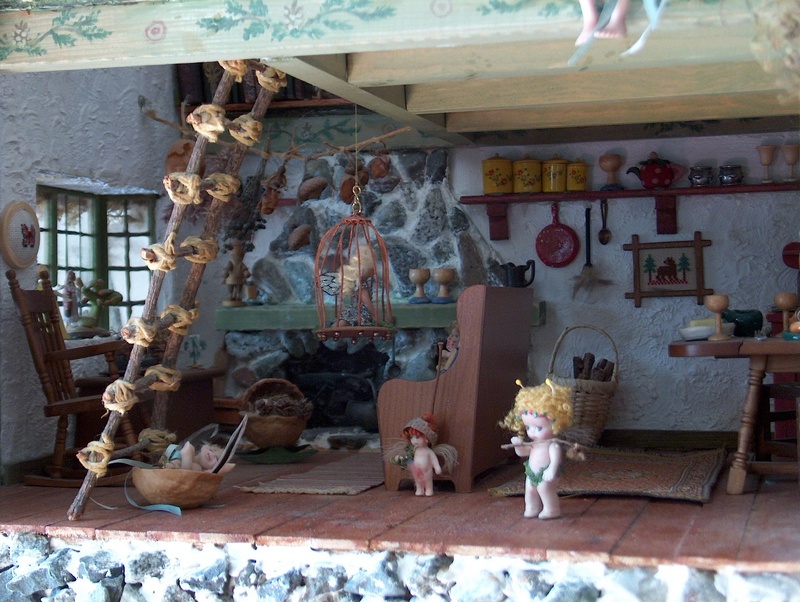 These fairies read nice, old books, and gather and dry seed pods and rose buds in front of the chimney. 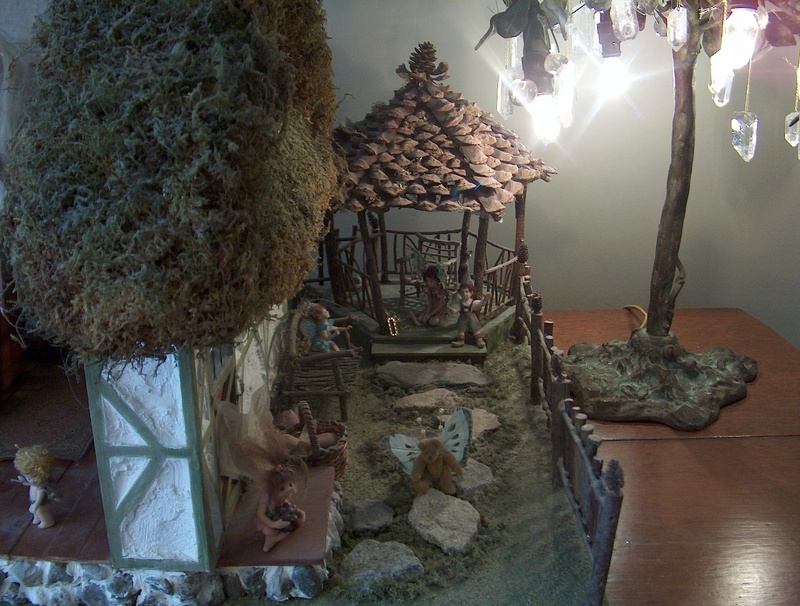 I sculpted the shy little sitting baby, made the walnut shell cradle, and painted the beams. 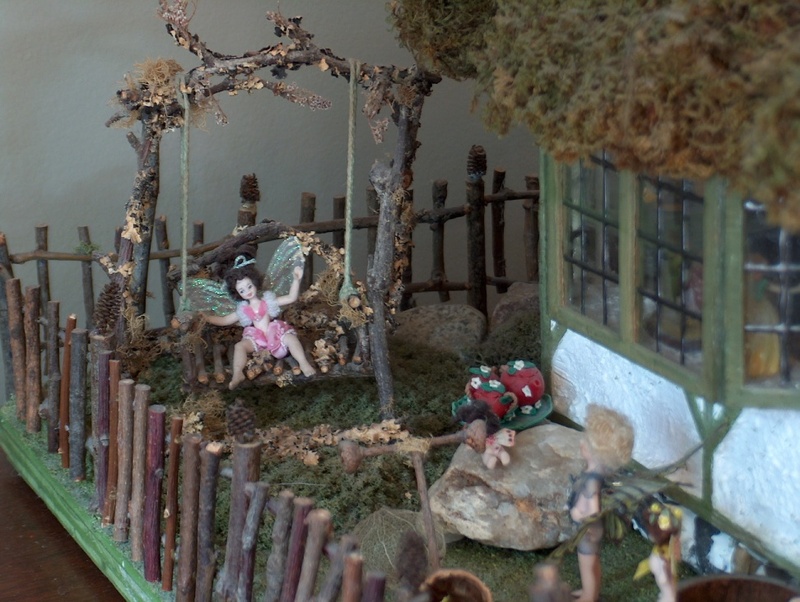 I also made the twig bed. A fairy bear is coming down the garden path! 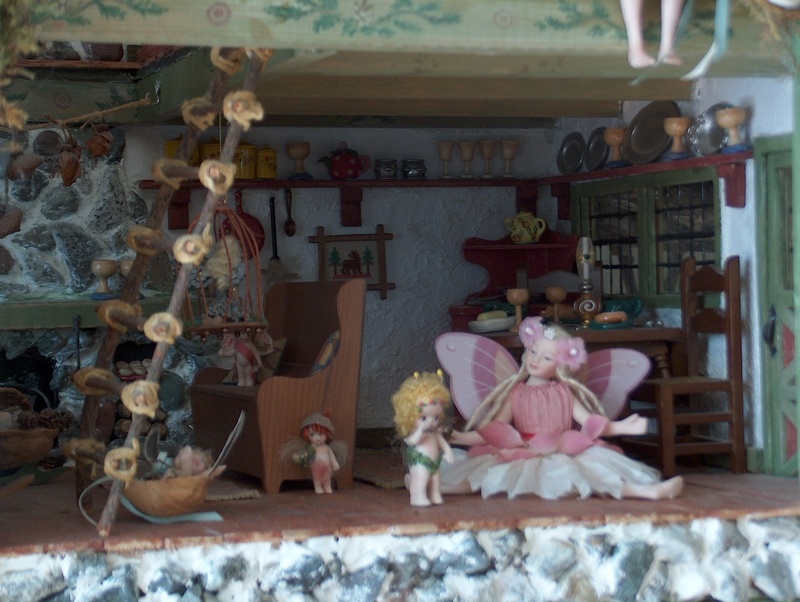 Various fairies by Sammy Smith, Judith Orr and Kathie's Kuties (Kathryn Aydelott Force). Another Kathie's Kutie is sleeping next to the twig bench I made, with it's own snail-like shell. 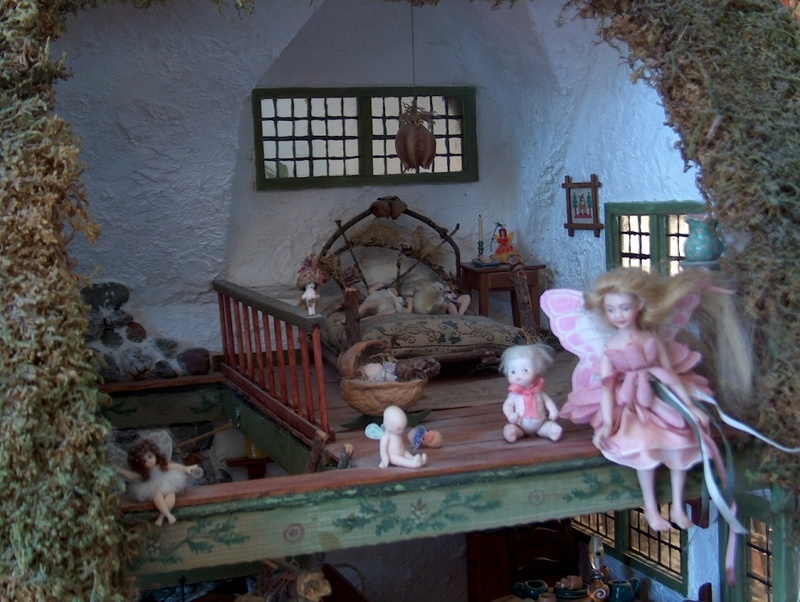 Various fairy dolls... by Judy Orr, Sue Ann Thwaite (LadyBug), and Sammy Smith (in the cage). I did some "kit bashing" by eliminating the access opening to the loft (to make more room for the bed), and moving the ladder to the front (I didn't use their stairs), thereby freeing up wall space on the main level. I didn't use their detail for the top of the chimney, preferring to make my own out of rocks. I made the plate rail for the back and side walls out of scraps from the house kit. The wooden goblets with blue bases are old German miniatures. The pewter mugs are actually beads. I made the wooden goblets with bell shaped beads, toothpick stems, and a flat round wooden bead as the base. 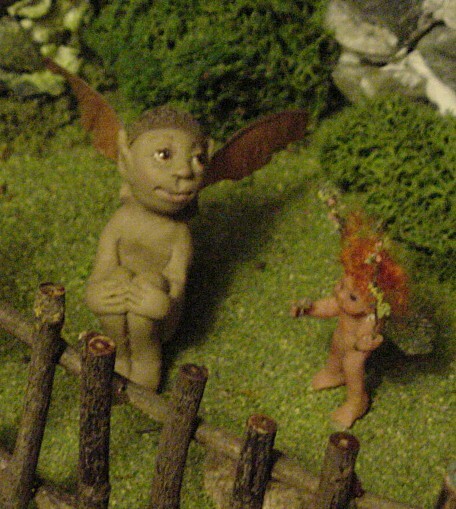 The elf with the maple seed pod wings and acorn cap was sculpted by me. 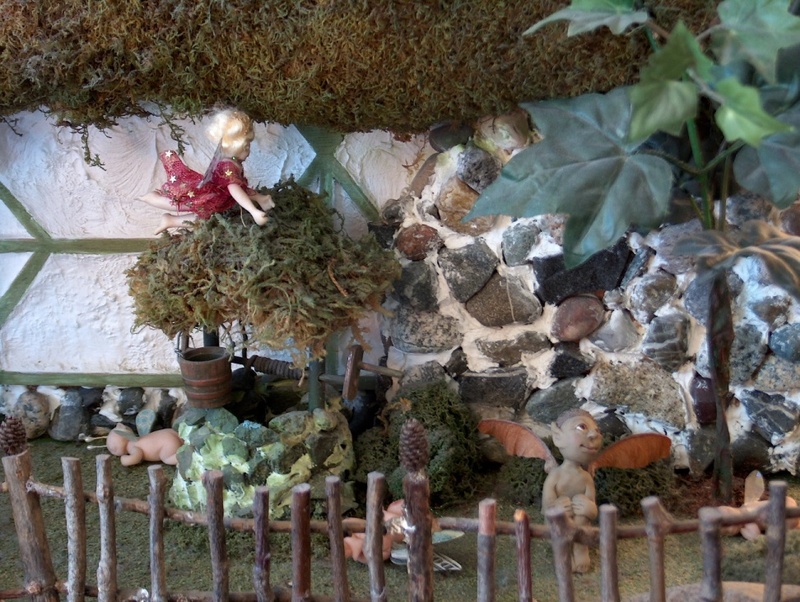 The little guy standing next to him is by Kathie's Kuties (Kathryn Aydelott Force). 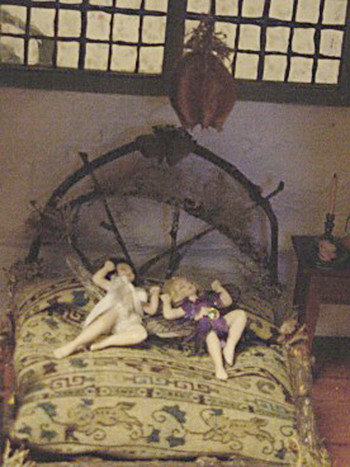 The "light" hanging above the bed is a dried seed pod with lichen embellishments. Dolls by Sammy Smith. First of all, you need to work with dried twigs. You can dry them carefully in an oven - at about 200 - 230 degrees. Or just let them dry somewhere warm naturally. You can strengthen your twigs with a product by Minwax called wood hardener - available in most hardware stores. It is great stuff for working with fragile natural materials. You mix it 50/50 with acetone. For your glues, use tacky glue (thicker and less runny than regular white glue) and Zap-A-Gap glue. It is a super glue, but you can also use it to fill any gaps between the joint of two irregular surfaces. Get the spray accelerant that the Zap-A-Gap company makes too. This, when squirted on the wet glue joint, will *instantly* bond the glue. It is amazing and really helps. You can't easily clamp or tape twig things while waiting for the glue to dry.... You can get this glue and accelerant from any good miniature store. Earth and Tree ships anywhere and they give great service. If you have bad or messy glue joins to hide, you can paint the glue with a mossy green-brown colored paint, or glue bits of moss or tiny dried flowers over it: use your imagination! To make to scale sizes, I recommend you measure real furniture and then divide your figures by 12 for the 1/12 size. 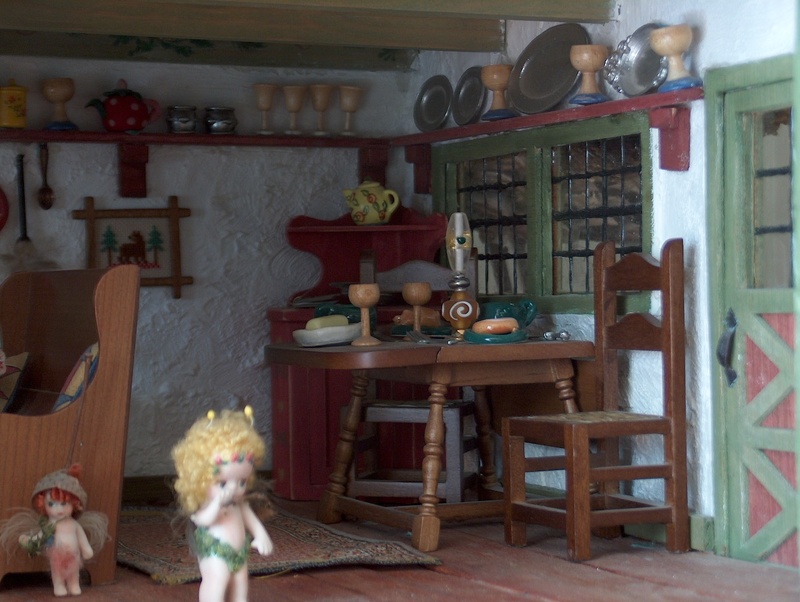 You can also use an inexpensive dollhouse doll and see if the doll fits.... or have regular dollhouse furniture in front of you and hold up your twigs to each section as you build.